Posted December 2nd, 2018 by Guild & filed under Uncategorised. By popular demand we have a new sweeping certificate! We hope you like them – see sample below. 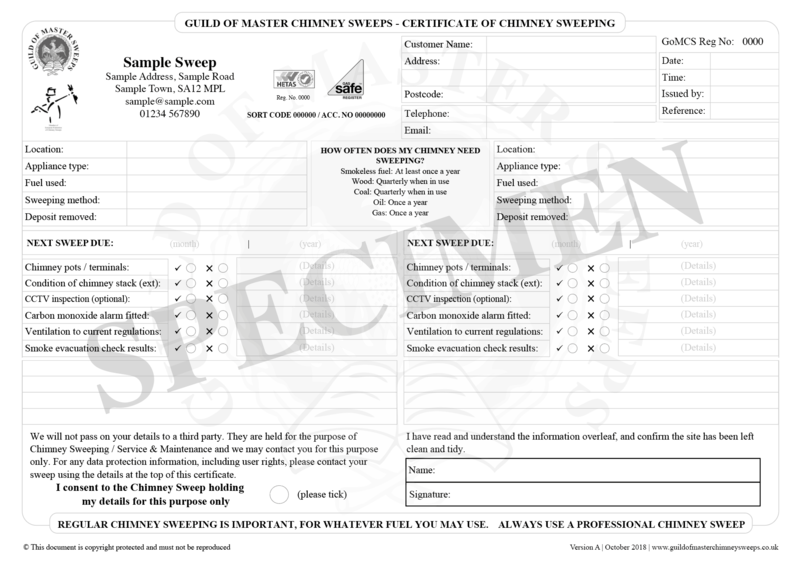 Guild members can now take advantage of the redesigned sweeping certificate. This is the certificate where all the details of each job are recorded. It’s an important document for both the sweep and the customer. The new certificate has a number of improvements to save you time, money and resources. You can now enter up to two appliances on the one document saving time and money. The certificates are available in duplicate or triplicate, saving on paper where triplicate is not required. The GDPR information is printed for your customer to tick and authorise you to contact them in the future. The Industry Standard details are now printed on the reverse of each copy. You can continue to use up your old stock. Thanks to Guild members Andrew Taylor and Thomas Wiggins who, along with the board, helped design the changes.